Renderings available on the website. regionalArchitects was retained by Holborn Investments and the facilities management division of Sodexo Canada to design a 330 bed student residence serving students of Ryerson University in Downtown Toronto. Mutual Street is a north-south local road running parallel to Jarvis and Church Streets to the immediate southeast of Ryerson’s main campus. Ryerson’s 2009 Campus Master Plan identified two precincts surrounding the main campus quad: the broad residential precinct which encompasses the mixed-use and residential community surrounding the campus; and the academic precinct which encompassed the central campus and all the University’s academic and support facilities on adjacent streets. The building site at 77 Mutual Street sits well within the University’s academic precinct and, as such, was seen as an ideal location for privately developed and maintained student housing. The residence, which when complete will seek full affiliation with Ryerson University via a legal covenant, includes accommodation for 330 students in a mix of single, 2 bedroom, and 4 bedroom units. Each unit is designed as a fully serviced suite with kitchen, dining, and living areas. A series of communal living areas, expressed on the exterior of the building through the use of tinted curtainwall glazing, are distributed throughout the building to provide the required mix of amenity and student-life programming. The building also includes 9,000sf of retail space and 3 full storeys of Ryerson academic program space. This appears to be the same general location as 186-188 Jarvis (which would have a secondary access to Mutual), already proposed as a Ryerson residence by IBI Group. This was either a separate, yet unsuccessful submission (most likely case) or less likely these are two separate projects. Ryerson had stated that there were several projects in the works, so between these two and the residences on top of the Church street building, this should add quite a few residence spaces. Looks quite nice but spandrel is a tad worrying. The 186 Jarvis proposal does not go all the way through the block. This is a separate proposal. To quote the esteemed Prof. H. Farnsworth, "Good news!" Here's a map showing these two Ryerson residence projects and other upcoming developments in the area. What I like about it is that Ryerson is expanding to the south of Dundas. I hope they can acquire more land between Dundas and Queen and transform this sad area. Love this project: Hope rA gets more gigs! Wow, nicely done Ryerson! I definitely agree that expanding south of Dundas is a great move. At the very least, there are quite a few parking lots that can be bought and redeveloped. I hope these two residence buildings solve Ryerson's horrible residence situation.. there are currently only 500 residence spots, with 350 of them reserved for out of province students. Its one of the only universities in ontario without a first year residence gaurentee. Yup, general rule when I went there was if you live closer than 2 hours away, make alternate plans just in case. Hopefully this will allow Ryerson to admit more GTA students into residence, and allow the school to reduce the "commuter school" label. From my Planning class in 1st year (when most the most number of students are in residence), the number of my classmates in rez was in the single digits (from a class of about 60). 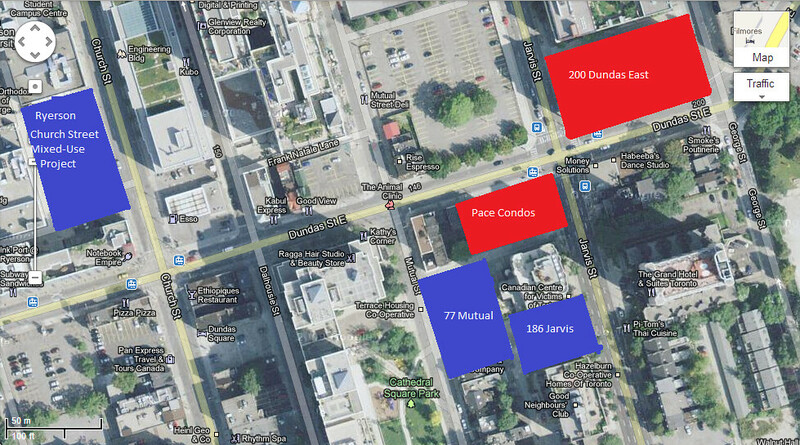 Ryerson' acquisition of those two parking lots on the north side of Dundas @ Mutual & Jarvis will likely contribute possibilities for even more rez and mixed-use space. The lot that surrounds Pizza Pizza (SW corner of Dundas/Church) is the one that I'm really curious about on what's happening next. To rezone of the subject lands to allow for the construction of a 38-storey mixed use condo building containing 375 dwelling units and 100 parking spaces below grade.